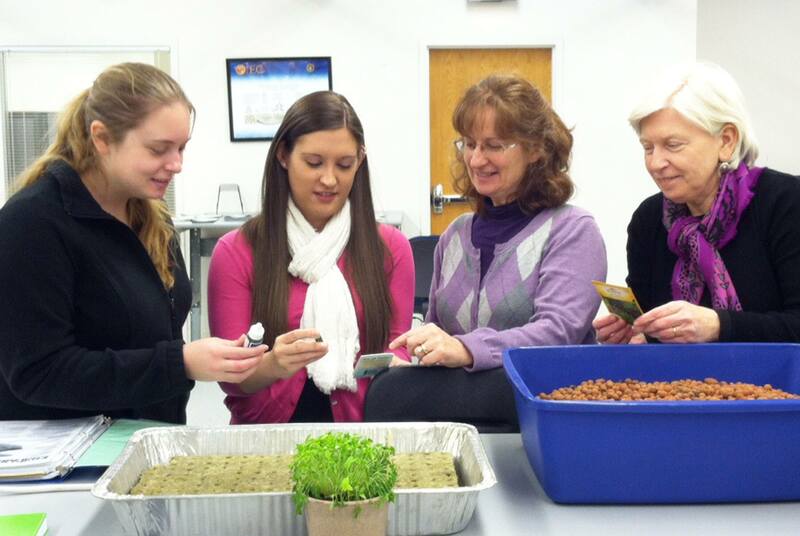 WJU students join faculty member Dr. Mary Railing and Dr. Laurie Ruberg, founder of the new Wheeling-based tech company, PLANTS, LLC in examining hydroponics systems. A partnership between a new Wheeling company and Wheeling Jesuit University’s Appalachian Institute focused on using hydroponics education to answer food needs of the Appalachian region has received a boost in the form of a seed grant from a West Virginia economic development initiative. 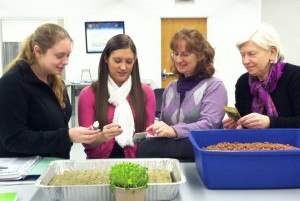 The Innovation Transfer Consortium (ITC), a project of TechConnect WV, has awarded a $5,000 seed grant to Wheeling’s PLANTS LLC and WJU’s Appalachian Institute to develop and commercialize educational programming about simple, inexpensive and easy to implement hydroponic vegetable production systems to address the Appalachian area need for higher nutritional food accessible to low income populations. Hydroponics growing systems are able to re-circulate water to supply plant roots with nutrients without using soil. Although hydroponics has been around for centuries, interest in the approach has been rekindled because of the potential for environmental advantages, elimination of soil borne pests and diseases, higher crop yields in smaller spaces, and elimination of weeds. Based in Wheeling, PLANTS LLC was created by Laurie Ruberg, Ph.D., who has 20 years experience designing plant science and educational technology connections, particularly through initial work at Wheeling Jesuit’s NASA Classroom of the Future Program. PLANTS LLC teamed up with Dr. Mary Railing, WJU faculty member and research and advocacy associate with the university’s Appalachian Institute for this research project. The Institute’s goal is to work for safer, healthier and stronger communities in West Virginia and the rest of the Appalachian region. Ruberg said based on the PLANTS and WJU collaborative research, PLANTS will be working to market and disseminate hydroponic plant kits for schools and community groups. “Year-round winter gardening would open up even more opportunities for family and community gardens to provide supplemental nutrition conveniently and inexpensively,” Ruberg said. “This project will result in an educational product that provides teachers with professional development support to help them integrate plant growth, development and ecosystem activities into their inter-disciplinary curriculum,” said Ruberg. She said the project will provide classroom lessons on germinating seeds, growing and harvesting plants and allow students to design and build their own inexpensive hydroponic plant growth systems. The project will test the feasibility of three different hydroponic plant product systems for use in an elementary science education program and then develop curriculum materials. ITC is an initiative of TechConnectWV, a statewide economic development organization that works to foster and promote innovation-based businesses and entrepreneurial activities throughout West Virginia. ”The ITC specifically works to help forge productive connections between the researchers at work in West Virginia’s innovative institutions of higher education and the potential private sector partners who can help turn their work into viable products, services, technologies and, ultimately, jobs,” said Anne Barth, executive director of TechConnectWV. ITC Director Jack Carpenter explained that the PLANTS/Appalachian Institute partnership is a great example of the types of work the organization is seeking to support through its seed grant program. Wheeling Jesuit faculty member Dr. Mary Railing and a team of student researchers majoring in chemistry, nursing, education and environment and sustainability will work on the project. “The Appalachian Institute is excited to carry out its mission of promoting research, service, and advocacy for and with the people of Appalachia by partnering on this inventive educational opportunity, Railing said. Carpenter said ITC continues to accept seed grant applications from partnerships involving businesses and higher education. Grant application materials are available at: https://techconnectwv.org/jobs/apply/959/.